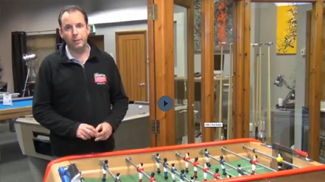 Biggest range of Garlando football tables and foosball for the home and commercial use. Lowest prices. All with free delivery! Garlando, a quality Italian manufacturer, made their first football table back in 1954. In the 50 years that have passed since then, Garlando has grown considerably and now exports to more than 50 countries across all continents. The Garlando brand is synonymous with quality, innovation and design and it is for these reasons that Garlando is one of only five companies that partner the ITSF (International Table Sports Federation). All the tables come with premium features and Garlando manufacturer tables to suit all ages, budgets and requirements. Home Leisure Direct are an experienced distributor of the Garlando table football brand and we can also supply direct to the education sector and institutions. All of our Garlando tables come with warranties and sourcing any spare parts is not a problem like with the cheaper tables on the market. These are built to last. All the Garlando table footballs are manufactured in Italy and come with clear concise instructions on how to assemble. Most Garlando tables can be assembled in under 45 minutes.